Posted on August 7, 2018 at 11:27 am. When a law firm starts an engagement with our marketing agency, we always setup our reporting and infrastructure. This includes call tracking. We communicate the value of this during the “sales” process. I like to think it’s what makes our law firm marketing services more attractive than the competition’s. Attorney [A]: Hey – why is my number changing on my website?! You guys are sending my business to the wrong attorney!! Mockingbird [MB]: That’s call tracking working as it should! It allows us to measure which marketing channels are working and which ones are not. We’ve confirmed the numbers are forwarding to your firm. Give it a try! A: Oh. Well I don’t want it. MB: You should! Without it, we won’t have useful data to make accurate business decisions with your marketing investment. A: I’ve had the same phone numbers for years. People have it memorized. Scrap call tracking. MB: We aren’t willing to fly this plane blind. You’re investing thousands of dollars in PPC and we need to know if it’s working. It’s also vital to lowering your cost per lead and client metrics over time. You should continue to use your direct number on your business cards and give it to new clients during your on-boarding process! A: What if a client saves a call tracking number? MB: The number will still work! We encourage you to give your direct number to every new client when they sign with your firm. We only report on first time callers, because we wouldn’t want to miscount existing clients that call back using a tracking number as a new lead. A: If I decide to leave MB, what happens? MB: We don’t hold you hostage. We would hate to see you go, however, we setup your tools so that you own them. If you want to stop leveraging CallRail, they can port any phone number out from their system and into your preferred call software. A: I’ll just ask my clients how they found me. MB: They will tell you “the internet”. Which isn’t wrong, it’s just not helpful. A: You’re not going to budge on this are you? Our 10 Commandments are displayed proudly on the wall every employee (and visitor) sees them as they enter our office. #3 is “Don’t Make Clients Happy, Make Them Successful.” Call tracking will help our marketing agency make your law firm successful. If you don’t like it, there are at least a dozen other law firm marketing agencies that will light your money on fire for you. We’re just not one of them. What do you REALLY need in your marketing mix? Posted on November 3, 2017 at 8:47 am. We’re frequently contacted by clients who already have a clear idea of what they want from their online marketing firm. Sometimes they’re dialed in to the point where they already have a list of items they need help with and a clear roadmap for where they’re heading. However, this is far from the norm. More often than not our prospective clients come to us either having previously worked with an agency (or multiple agencies) or as a blank slate looking to create an online footprint and start marketing their practice online. In most cases, the bulk of our initial conversation is spent talking through the client’s goals and identifying which channels and tactics make the most sense in order to get them where they want to go. For anyone asking, “what do we need to do in order to be successful online?” the response is always the same: how are we defining success? I want to make money. If revenue is climbing I’m going to be happy. I want to target a specific type of case. Inquiries from other practice areas are a distraction or a bonus. I want to pick and choose which cases I can take. I want a high volume of inquiries and will pick which ones I want. There’s merit to all three of these approaches, and each one necessitates a different set of tactics. This is one of the few aspects of our client’s practices where we can’t make an effective recommendation or provide any useful guidance. It’s up to each individual attorney to decide how they’re going to measure success and then let us adopt a plan that will help them achieve those results. Once you’ve clearly defined what a successful marketing campaign looks like, it’s important to benchmark against your most relevant metrics (revenue, signed cases, or total inquiries) and make sure the tactics you’re prioritizing will help you achieve your overarching goal. As an example, if your primary goal is to drive revenue, you shouldn’t get bogged down worrying about whether you’ve published any new content in the past month unless you’ve firmly established that new content is the best way to generate revenue. Similarly, if you’re making a huge push for DUI cases it’s not worth obsessing over your site’s organic rankings for the more generic term “criminal defense attorney.” You’ll be better served keeping your eye on results directly relevant to the cases you’re trying to generate. This isn’t to minimize the value of setting intermediate goals or looking at multiple trends, it’s merely a reminder to stay focused on what’s most important instead of getting paralyzed by the massive amount of data available on a monthly, daily, and even hourly basis. So, what’s the most important thing in your marketing mix? Reliable data. Almost no one comes to us specifically asking for business reporting, yet it’s arguably the most valuable service we provide. With all the data available through Google Analytics, AdWords, CallRail, Search Console, and countless other tools, it’s easy to identify which pieces are contributing to the success of your business and which ones are distractions. 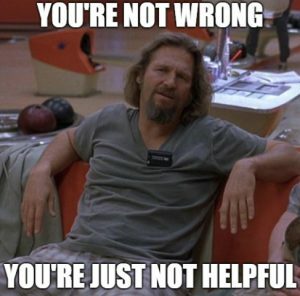 Did you publish 5 blog posts and get zero clients and zero backlinks as a result? That’s probably not something you need to keep doing? Is one channel driving 75% of your inquiries for car accident cases? You might want to expand your budget there…assuming your goal is either more PI cases or more revenue. There’s no substitute for knowing what’s actually working. Gut feelings or informally polling your new clients about how they found you is unreliable at best and comically misleading at worst. If you want to win at search, you should do the things that work and ignore the ones that don’t. That may seem simplistic—because it is—but it’s not possible if you don’t clearly define a goal, configure your infrastructure to accurately track everything you’re doing, and then allow data to guide your marketing efforts. Posted on August 25, 2017 at 8:00 am. Tracking the efficacy of your law firm’s marketing and advertising is vital to understanding how well your investments are paying off. Proper UTM codes, a type of URL parameter for Google Analytics, is the first step to accurately tracking campaigns. How and where you implement these URL parameters varies based on what platform you’re running ads from. 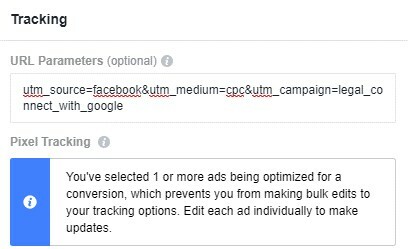 Facebook ads has a “Tracking” section where you can add custom parameters for each of your ads. If configured properly, you can categorize traffic and conversions in the proper marketing channel. The important thing to remember when implementing these in Facebook is you should NOT include the ‘?’ before these parameters in this section. Facebook automatically amends the destination URL to include the ‘?’ before the parameter you entered. You can find the official Facebook help article here. There are a variety of URL parameter tools that can help you make the UTM codes that interface into Google Analytics. Posted on May 18, 2017 at 10:15 am. For years, I’ve been pushing lawyers to take control of their data and utilize Google Analytics as a source for accurate, meaningful, actionable website performance data. Don’t trust your vendors to tell you how good your vendors are – because – surprise surprise, the are incented to self report bigger and better numbers – a freakshow self-interested Napeoleon complex designed to hide their own failings. Here’s a shining example, courtesy of Hubspot, of how vendors manipulate data to appear bigger than they actually are. The online marketing equivalent of a frightened puffer fish. In Hubspot’s “Visits” reporting, the overall trend looks very positive – slow solid stead growth. We call this “up and to the right” and its the trend we strive for with SEO engagements – more traffic yields more calls, yields more business. This slow and steady improvement is typical of a very well run SEO campaign. Look a little closer – Hubspot’s up and to the right is cumulative. Each month they are simply adding the cumulative total of all the previous months – so mathematically it can display nothing but up and to the right. Using this same mathematical approach, I’m 1,066 years old. The question I pose, is “why”? Why would you depict data this way? Why would you chose to visualize last month’s data as a cumulation of all previous data? The answer (to my admittedly cynical mind) is simple: at a casual glance (or to the uninformed or analytically challenged) – cumulative results look like growth. Even when its not really growing. Stop trusting your vendors to tell you how well they are doing. Google Analytics is Lying to You! Posted on December 15, 2016 at 6:00 am. Do not trust the data in Google Analytics. It is lying to you! Even if you installed the tracking code correctly, all the data you see is incorrect. It’s tainted, false, misleading, and wrong. It’s a huge mistake to make any decisions based on the data in Google Analytics… unless you make some essential adjustments. Where Does the Misleading Data Come From? Google Analytics is a very popular target for spammers and hackers. Just recently, sites across the world were hit by spam that looked like referral traffic from Lifehacker and Reddit. Semalt is another popular source that has been spamming Google Analytics accounts for years. Other spammers are more subtle and use “ghost” hosts to infiltrate your website data. Spammers are relentless, and they’re developing new techniques every week. While spam is the primary destroyer of good data, your website traffic may be skewed for another reason. If you’re looking at traffic reports and think all the sessions are potential customers, you’re wrong. Your own office may be inflating traffic numbers without realizing it. While this is not fake traffic, it’s not valuable traffic either. Other sources of bad data include bots, spiders, crawlers and other digital marketing tools. Call tracking and chat software often impact the quality of your Google Analytics data, and poorly coded robots can appear as human visitors. All these sources must be wiped out before you can begin to even remotely trust Google Analytics. If you plan on using Google Analytics in any way, you must prepare your account to block all the bad data. Here at Mockingbird, this is the first thing we do before working on any website. It is very important to create multiple property views because once you start messing with Google Analytics data, there is a chance you may irreversibly break something. We suggest creating at least 3 views – Raw Data (the untouched backup), Master View (the one you use), and Test View (the one you test with, obviously). Once you have these views set up, you’re ready for step 2. 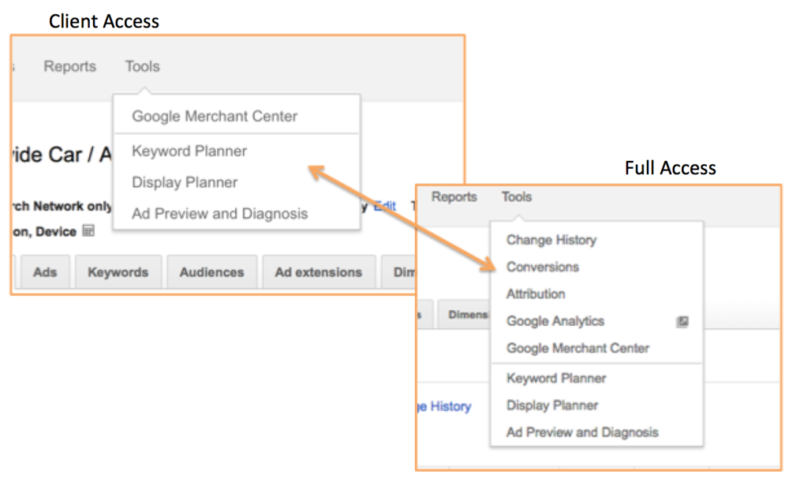 Filters block data from ever hitting your Google Analytics account. If you filter all traffic from Russia, you may still get traffic from Russia, but you won’t see it in your Google Analytics account. It is important to understand Filters apply to future data and cannot be retroactively applied. If you want to remove spam from historic data, you’ll need to apply Segments (more on that later). Again, once these are applied, the filtered data is gone forever. Make sure to test each filter to make sure it works correctly. This one’s easy. Google Analytics has an option under View Settings that is called Bot Filtering. It “excludes all hits from known bots and spiders.” Check the box and hit save! While Filters will help keep your data clean in the future, there is still a way to save your historic spam-filled data. Create a Segment that matches your filters so it excludes the bad data. You’ll need to apply this segment every time you look at your data, but it is a great way to accurately analyze past performance. Does This Really Fix Everything? I wish this were the end of the story. However, spam sources continue to evolve and you’ll need to update your filters and segments regularly. Furthermore, UTM codes (used for tracking digital marketing campaigns) may wreck havoc on your account if not implemented correctly. Check your account monthly, if not weekly, to make sure your data stays clean. Create custom channel groupings if you need to. If you or your marketing agency aren’t proactively monitoring the Google Analytics, you may be making misinformed decisions based on misleading data. Stay on top of it, and Google Analytics can be an invaluable gold mine! Why Does Scorpion Think Your Data is Theirs? Posted on November 1, 2016 at 10:47 am. I received a disappointing email today from a law firm who I’ve been helping assess the efficacy of their current marketing efforts with Scorpion. Our discovery process centers around performance through Google Analytics and I find again and again agencies who have failed to a) add GA to their clients’ sites (FindLaw is notorious for this) b) refuse to provide any access to the account or c) fallaciously believe that the law firm’s data actually belongs to the agency. The latter is the case we are dealing with for this Scorpion client. But let’s stop first and make these points very clear. Your site’s data is your data. Not your agency’s. You should control how it is configured (even if they do it for you). You should control who has access to it. You should be able to take it with you if you leave your agency. You should be able to kick your agency (or ex-agency, or ex-employee) out of the data if you want. What are they trying to hide from me? Imagine investing in a 401(k) plan without knowing what your annual rate of return was? Well that’s what you are doing if you don’t have access to your GA account. And don’t rely on your agency to tell you how well your agency is doing with your agency’s proprietary reporting platform. Everything you need to know can (and should) be housed in GA – putting you in full control of both the data and the analysis. You told me that I needed to get control of the Google Analytics account. I made the request to Scorpion and they provide “view access” for my gmail user account. They said that they cannot transfer G.A. because it is a mixed account. Ignoring the technical feasibility of the transfer, it doesn’t appear that they are willing to transfer the account. My question- is view access to G.A. account sufficient to obtain valuable information for future effort? Unfortunately, I don’t have permissions to delegate views to others. And to the law firm’s last question…. is view access to GA sufficient? The answer is usually no…. because depending on the configuration of the account, you can’t even view all of the data. But would Scorpion really hide critical information from you through their configuration of Google Analytics? You bet they would. In the graphics below (taken from another Scorpion client), note how the limited Client Access doesn’t show data on things like….. conversions. Kind of important if you are dropping $75,000 monthly on Google Adwords don’t you think? Wouldn’t you want to be able to see if people are actually calling? filling out forms? chatting? Without that conversion data, you just have to rely on what your agency tells you. As far as Scorpion’s explanation that “they cannot transfer G.A. because it is a mixed account” goes… remember, we put a man on the moon in the 70s, we should be able to provide appropriate access to a simple website tool. And Google Analytics has had this functionality for years. 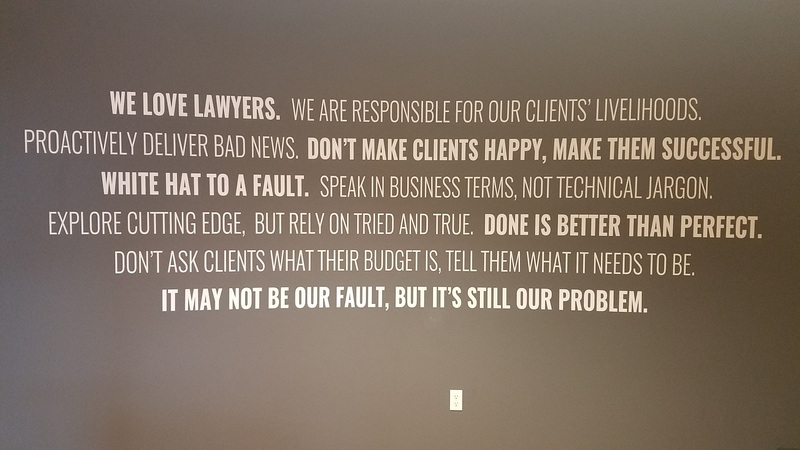 Mockingbird does this for all of our clients, as have most of our reputable agency cohorts. And Scorpion, if you are stuck…. here’s Google’s guide to their User Permissions. Are Your Partners Sending Fake Traffic? Posted on March 8, 2016 at 9:02 am. 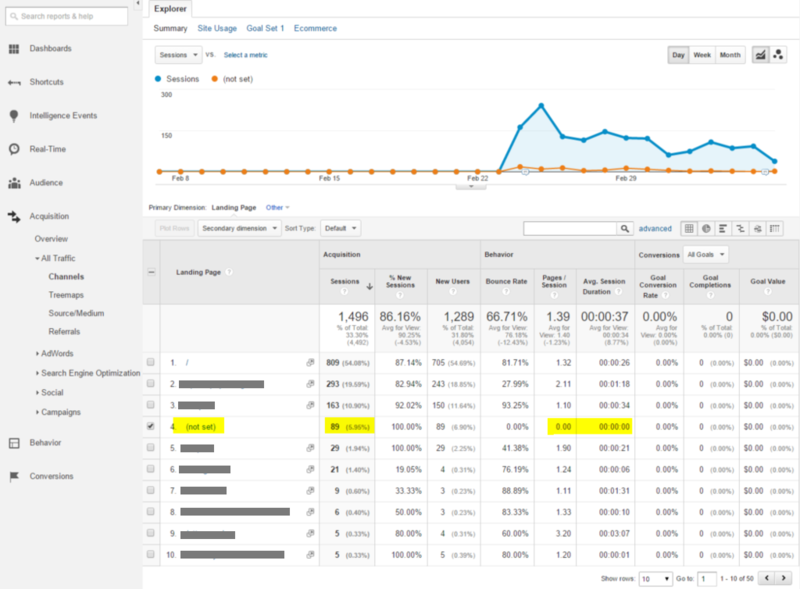 The issue at hand is the way conversions are reporting back to Google Analytics data. A good reporting infrastructure is built not only on traffic – but also the frequency of that traffic doing what we want – in the law firm sense, this means (for the most part) filling out an online form or calling the firm. We’ve looked at two different cases in which both online and offline conversions are being counted as a second or even third session, which means over reporting traffic. This means, a session generating a lead is erroneously reported as three different website visits. If you dig deeper into those sessions – you see (in the graphic below) them applied to Direct traffic and that they see zero pages and zero time on site. You’ll also notice – in this case they inflate direct traffic volume by 6%. Not huge numbers, but not insignificant if you are watching things as closely you should. This is simply a very sloppy integration with Google’s API – Apex told us they are aware of the issue and have a resolution; although they didn’t roll it out to us when we requested. 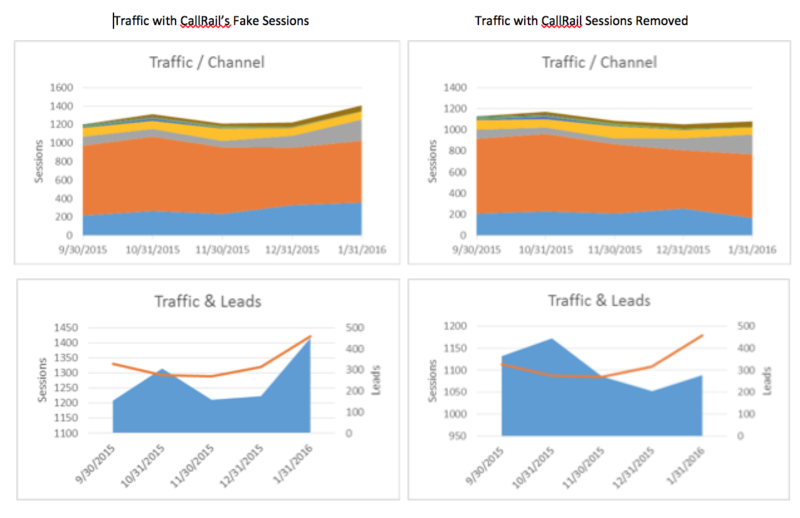 The CallRail issue is more difficult, because frankly tracking an offline conversion back into an online reporting system is tactically much more difficult. Essentially, the phone number identifies the channel that generated the session; however, tying the call back to the specific session is much more difficult. (The work around is to utilize CallRail’s per session based phone tracking, a significantly more expensive alternative.) But you can see, given the sheer volume of calls generated by a website, that there’s a large inflation of sessions – in this case, they are accurately allocated to the appropriate marketing channel – so traffic for all channels gets artificially inflated. In our example, this was a sitewide artificial increase of 9%. In the graphic below, look at the dramatic difference in patterns between the inaccurate (first column of graphs) and accurate (with the duplicated traffic removed) second column of graphs. For now, I’ll reject my internal cynic and reject the hypothesis that some especially crappy agencies are deliberately implementing tools to artificially boost their numbers….. or, hmmmm, maybe I’ve just enabled them with the information to do so. Posted on August 20, 2015 at 4:12 pm. Switching from one marketing agency to another probably feels a lot like trying to cancel your Comcast contract. However, it’s not only hard on the business looking for a new agency, it’s hard on us too. Taking over a client means taking over all of their baggage (good and bad). Don’t be mistaken; we love bringing on new clients regardless of the situation or agency they are leaving, but some situations are certainly more challenging than others. In the first period after launching the new site (Mockingbird reports on 28 day periods) we took a 37% drop in organic traffic. Hmmm. I expected traffic to be relatively flat since we hadn’t made any real improvements to the site, aside from adding a few plugins. I certainly didn’t expect a colossal drop in traffic. We did site-wide redirects to remove the “.aspx” from the end of every URL. This may have confused Google and the search giant just needed time to adjust. It was a holiday weekend and we’re dealing with small(ish) traffic numbers so that could have a large impact. Lastly, we’re dealing with small numbers so a 37% drop seems more drastic then it really is. After informing my client of the possible reasons for the drop, I had to tell them honestly, “I’m not sure.” That’s not a good feeling. I’m the expert and should know the answer. On a side note, I will say that all the other data points looked to be going in a positive direction. Local traffic and number of leads generated was up, and the cost per lead was down. Other site metrics looked good too: the site speed had drastically increased, the number of indexed pages took a huge positive spike, our number of impressions grew since the last period, and the average rankings moved up by 5 spots. Feeling unsatisfied with our lack of answers, I dredged through the data again with the goal of finding exactly which pages lost organic traffic. If I could identify a trend in those pages, I could do my best to reverse that trend. This time I found something I missed before. Allow me to explain why this is so disconcerting (hopefully without losing you in technical jargon). We typically see organic sessions to normal website pages that look similar to this: sampledomain.com/criminal-law/ but instead we were seeing these crazy long and complicated URL endings. In the example URL you’ll see a bolded section “PPC=Google” which tells me this particular URL is used to track advertising (PPC=Google means pay-per-click advertising with Google). Now, it’s not weird to see a tracking parameter like this, but it is weird to see it in the Organic traffic bucket of Google Analytics. The website sessions to this URL should be counted in the paid channel and not an organic channel. Now I knew the data I had reported to my client was inaccurate. We actually increased the number of organic sessions in the first period but initially failed to see it because of these “PPC” parameters messing with the data. Dig deeper into the data and always investigate traffic drops and other anomalies to find causation. It’s imperative to report data accurately, don’t give up and settle for a theoretical answer (SEO lends itself to this) when you have an immense amount of data at your fingertips. This point becomes especially important when taking over a client from a different agency. Although Google Analytics is already completely free and built by some of the smartest people in the world, there are companies out there that elect to use their own data tracking software. Be mindful of this when delving into your own data. Posted on April 7, 2015 at 4:05 pm. Thank you for taking time to speak with me yesterday. I requested Google Analytics access from our marketing company and received this response. Any thoughts? AHHHHHHHHH! This makes me so mad. The agency in question is stupid – has inherited the site, doesn’t know GA was already installed, never considered installing it and has genuinely chosen a proprietary reporting system that lumps access across multiple sites into a single log in. The agency in question is smart – is doing 4/5 of nothing to work on the site and is deliberately hiding data so they can keep cashing their checks. Oh – and they’d be lying about not being able to grant access to Google Analytics. Unfortunately, lawyers asking for access (especially admin access) to Google Analytics is often the first step tipping off an incumbent agency that they may be on the chopping block. Sadly, some immediately turtle up – withdrawing as much as possible and trying to control their own clients information, passwords and access. That’s what we have here. Remember attorneys, this is your site, it is your data, it is your performance, it is your prerogative to hold your agency’s feet to the fire. Google Analytics data (and access to it) is yours to control. Biggest red flag for any agency is the refusal to share data, let alone putting clients in control of it.